If you're going to spend hours building a woodworking project, it makes sense that you would want the finish to be able to show off your handiwork and protect it for years to come. The difference between a good woodworking project and a great one is often the quality of the wood finish. In the following items, find a number of tips for beautiful wood finishes on your woodworking projects. Applying a Pre-Stain Conditioner. (c) 2010 Chris Baylor licensed to About.com, Inc. Many common softwoods, such as spruce, pine, fir (the SPF varieties), birch and maple have trouble absorbing wood stain evenly, which can create a splotchy look. A pre-stain conditioner applied to the wood prior to staining can smooth out the finish on these softwoods. Learn how taking the time to apply a pre-stain conditioner can provide much more desirable results to the wood finish on your stained projects. Applying a Gel Stain Finish. (c) 2010 Chris Baylor licensed to About.com, Inc.
Gel stains have become quite popular in recent years as a wood finish. Gel stains are easy to apply: simply wipe it on with a cloth, wait the desired length of time and wipe it off. By adjusting the amount applied and the length of time the stain is left on the wood, one can adjust the level of color in the wood finish. However, there are some drawbacks. Learn how to work with gel stains in this woodworking tip. 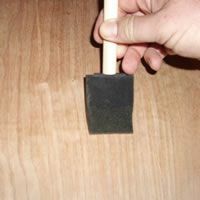 Applying Polyurethane with a Foam Brush. (c) 2010 Chris Baylor licensed to About.com, Inc.
After applying the stain of your choice to your project, you need a top coat that will keep your wood finish looking great for years to come. Polyurethane has become one of the methods of choice for protecting wood finishes because it is easy to work with, durable and very protective. Learn some tips for applying and perfecting a polyurethane topcoat to the wood finish on your projects. Applying a Clear Spray Lacquer Finish. (c) 2010 Chris Baylor licensed to About.com, Inc.
Lacquer has been a wood finish of choice for centuries. A lacquer finish is clear, very strong and protects well against damage caused by water. In this woodworking tip, learn the advantages of using lacquer to cover your stained woodworking finish, and whether you should spray your lacquer finish or apply by brush. One of the most breathtaking top-coat wood finishes is a hand-rubbed lacquer finish. Fortunately, it's not as difficult as the name might imply. A hand-rubbed lacquer finish can take a little bit of time, but the result is a mirror-like shine on your woodworking projects. Applying Shellac. (c) 2010 Chris Baylor licensed to About.com, Inc. Most people wouldn't dream of putting "insect goo" all over a woodworking project over which they've given their heart and soul, but that's exactly what you're doing when you apply a shellac finish. Used for 200 years to protect wood, shellac is a mixture of alcohol and a select insect secretion, but it provides one of the most beautiful wood finishes of any product. There are some drawbacks to shellac, but once you know how (and when) to use it, you'll want to give shellac a prominent place in your wood finish arsenal. Shellac may give one of the most attractive wood finishes of any top coat, but it certainly isn't the most water-resistant of finishes. That being said, shellac may be the easiest top coat wood finish to repair. There are a few steps to repairing shellac, but if you have a project that needs repair, you'll be glad you took the time to learn the steps, as you'll be rewarded for your efforts with a nearly flawless finish once again. Finishing with French Polish. (c) 2010 Chris Baylor licensed to About.com, Inc.
Perhaps a remnant of a bygone era, French Polishing is a technique that should be considered when choosing a top-coat wood finish. The shine that a quality French Polish can provide may be unrivaled. It takes a bit of time and effort to apply a French Polish wood finish, but the result will be a breathtaking shine that will show off your woodworking project like few other wood finishes could. Applying a Paste Wax Finish. (c) 2010 Chris Baylor licensed to About.com, Inc. If you're working with a rustic piece of furniture and want to preserve it with an appropriate wood finish, consider applying a paste wax wood finish. The paste wax finish is rarely used in modern woodworking, but for specific types of "raw" furniture such as Mexican hacienda pieces, the choice is quite appropriate. Spray Painting. (c) 2010 Chris Baylor licensed to About.com, Inc. Outdoor woodworking projects always present the problem of how to protect the piece from the temperature fluctuations, UV rays of the sun and moisture caused by being outside. Knowing that a project will be exposed to the weather will allow you to take some precautions and preventative measures before applying a paint wood finish to the project. Painted Plastic Bag Saver. (c) 2010 Chris Baylor licensed to About.com, Inc.
One of the problems that frequently occur with a paint wood finish is when paint drips occur. Most of the time, paint drips are caused by applying too much paint to the project too quickly. However, if you find a paint drip, there are some things you can do to minimize the visibility of the problem, even after it has dried. Learn how to deal with paint drips in this wood finishing tip.